The site is currently occupied by a residential block dating back to the 1960’s providing meagre accommodation considering the location and fantastic views across Hyde Park. The Client has recently considered refurbishment commissioning Blair Associates Architecture Ltd to review possible scheme design solutions. 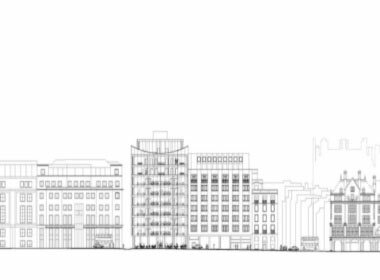 Blair Associates Architecture Ltd proposal is for wholesale demolition of the 1960’s building and a replacement scheme comprising basement spa facilities, ground and basement 1 restaurant facilities. First and second floor two, two bedroom apartments, third, fourth, fifth and sixth floors one floor exclusive four bedroom apartments, sixth and seventh floor penthouse with pool, retractable roofs and stunning views over the parkland in Knightsbridge. The proposed scheme seeks to use high performance glazing systems allowing maximum views across the urban landscape and parklands to the north with a combination of translucent and opaque stones to the south, east and west elevations, part of the concept for the new apartment building is to connect entrance and access facilities for security into the Berkeley Hotel to form an integral part of the residential facility. Architecturally the building extends two storeys above the existing building providing excellent floor to ceiling heights at every level, the composition of the façade using clear and translucent materials offers identity and change demonstrating the function of the building bracket sculptured upper storeys to locate its identity along this important western route.